This isn't a fix, but a guide to make the game 100% perfect in 3D (setting discovered thanks to the help of Kaimasta). Without any tweaks, the game will appear totally flat, the same as in 2D. 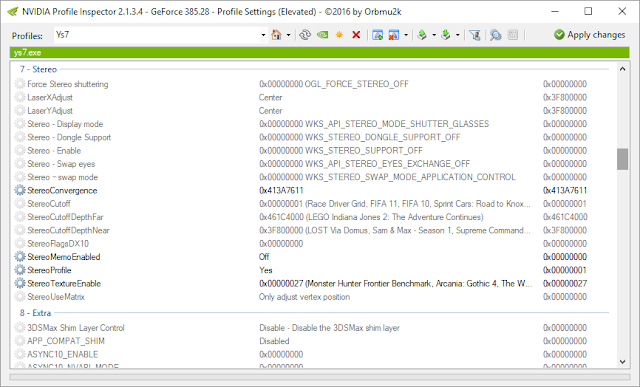 - Open Nvidia Profile Inspector, the open or create (if it doesn't exist yet) the profile of the game (for "Ys7", "ys7.exe" in Inspector). - In the "Stereo" section, set "StereoTextureEnable" to "0x00000027". Set "StereoProfile" to "Yes" too if you want. - Save the changes and play the game. The HUD will be at screen depth, but the game will look perfect. - Texture packs here and some little stuff in my github (I'll probably upload more textures in the future). 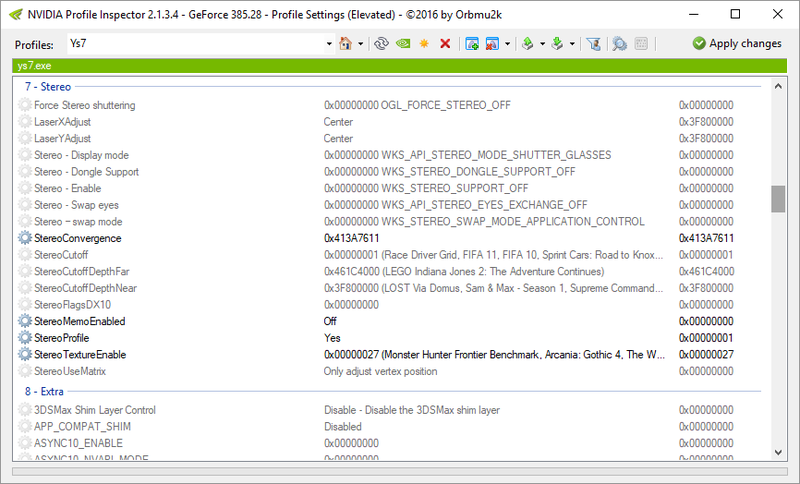 - As of this date (2017-09-28), make sure your max resolution or DSR resolution available is 3840x2160 (especially if you play in fullscreen) and not anything higher (or in between 2560x1440 and 3840x2160), to avoid a currently unfixed bug.